Critics of Guy McPherson would have us believe that Tim Garrett (in fact Professor Tim Garrett) has no independent existance of his own. Although he continues to ride a bike or bus to work, line-dry family clothing and use a push lawn mower, University of Utah professor Tim Garrett believes humans can't really affect climate change. 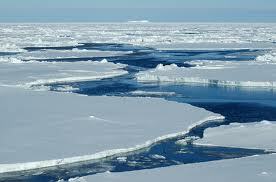 Instead, he says the Earth's course will run along a "predetermined trajectory." He doesn't see the major cause of global warming being stabilized any other way than if the increasing flow of carbon-dioxide emissions ultimately collapses the world's economy or society builds the equivalent of one new nuclear power plant each day. Nuclear plants, which produce one gigawatt of continuous power, would be necessary to compensate for the increasing growth in energy consumption around the world, said Garrett, an associate professor of atmospheric sciences at the U. Although it "feels good to conserve energy," he said, "there shouldn't be any pretense that it will make a difference." These views, both radical and controversial, will be published this week in Climate Change, an online academic journal edited by renowned Stanford University climate scientist Stephen Schneider. Other research journals declined to publish Garrett's research. Garrett believes current options to potentially avert climate change — increased energy efficiencies, reduced population growth and a switch to power sources that don't emit carbon dioxide, as well as underground storage of carbon dioxide from fossil fuel burning — are "not meaningful." "Fundamentally, I believe the system is deterministic," Garrett said. "Changes in population and standard of living are only a function of the current energy efficiency. That leaves only switching to a non-carbon-dioxide-emitting power source as an available option." Some economists are critical of his approach, but his solution is targeted to solve economic issues as "physics problems," looking at civilization as one big problem instead of calculating individual problems based on population growth, increasing energy efficiency and other things. "I end up with a global economic growth model different than they have," he said. Garrett treats civilization as a "heat engine" that "consumes energy and does 'work' in the form of economic production, which then spurs it to consume more energy," he said. "Economists think you need population and standard of living to estimate productivity," Garrett said. "In my model, all you need to know is how fast energy consumption is rising." It's like a child who "grows by consuming food, and when the child grows, it is able to consume more food, which enables it to grow more," he said, adding that when the food supply runs short, the child will stop growing and eventually die. "If society invests sufficient resources into alternative and new, non-carbon energy supplies, then perhaps it can continue growing without increasing global warming," he said, adding that it would be "too bad" if civilization pursued avenues for climate change that ultimately backfired. "Ultimately, it's not clear that policy decisions have the capacity to change the future course of civilization." Nov. 22, 2009 – In a provocative new study, a University of Utah scientist argues that rising carbon dioxide emissions – the major cause of global warming – cannot be stabilized unless the world’s economy collapses or society builds the equivalent of one new nuclear power plant each day. “It looks unlikely that there will be any substantial near-term departure from recently observed acceleration in carbon dioxide emission rates,” says the new paper by Tim Garrett, an associate professor of atmospheric sciences. 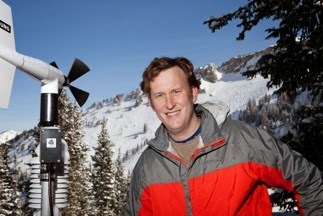 Garrett’s study was panned by some economists and rejected by several journals before acceptance by Climatic Change, a journal edited by renowned Stanford University climate scientist Stephen Schneider. The study will be published online this week. Energy conservation or efficiency doesn’t really save energy, but instead spurs economic growth and accelerated energy consumption. Throughout history, a simple physical “constant” – an unchanging mathematical value – links global energy use to the world’s accumulated economic productivity, adjusted for inflation. So it isn’t necessary to consider population growth and standard of living in predicting society’s future energy consumption and resulting carbon dioxide emissions. Garrett treats civilization like a “heat engine” that “consumes energy and does ‘work’ in the form of economic production, which then spurs it to consume more energy,” he says. That “constant” is 9.7 (plus or minus 0.3) milliwatts per inflation-adjusted 1990 dollar. So if you look at economic and energy production at any specific time in history, “each inflation-adjusted 1990 dollar would be supported by 9.7 milliwatts of primary energy consumption,” Garrett says. To Garrett, that means the acceleration of carbon dioxide emissions is unlikely to change soon because our energy use today is tied to society’s past economic productivity. Perhaps the most provocative implication of Garrett’s theory is that conserving energy doesn’t reduce energy use, but spurs economic growth and more energy use. “Making civilization more energy efficient simply allows it to grow faster and consume more energy,” says Garrett. 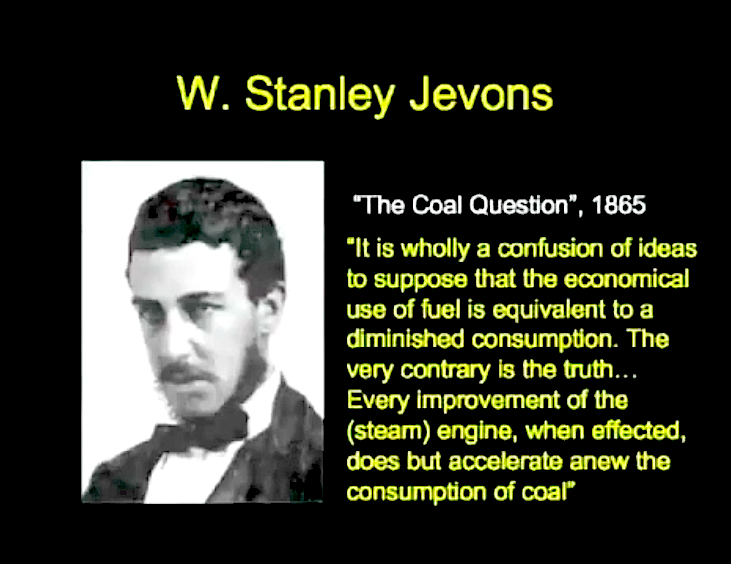 He says the idea that resource conservation accelerates resource consumption – known as Jevons paradox – was proposed in the 1865 book “The Coal Question” by William Stanley Jevons, who noted that coal prices fell and coal consumption soared after improvements in steam engine efficiency. So is Garrett arguing that conserving energy doesn’t matter? Garrett says often-discussed strategies for slowing carbon dioxide emissions and global warming include mention increased energy efficiency, reduced population growth and a switch to power sources that don’t emit carbon dioxide, including nuclear, wind and solar energy and underground storage of carbon dioxide from fossil fuel burning. Another strategy is rarely mentioned: a decreased standard of living, which would occur if energy supplies ran short and the economy collapsed, he adds. “If society invests sufficient resources into alternative and new, non-carbon energy supplies, then perhaps it can continue growing without increasing global warming,” Garrett says. On average the human brain experiences 70,000 thoughts daily and requires roughly 24 watts or roughly 500 Calories during that time to function. To keep modern civilization running, 17 trillion Watts of power are consumed, 4% of which goes to keeping humanity’s 7 billion bodies alive while the rest powers our buildings, machines, and agriculture. The laws of thermodynamics require that all systems, whether natural or inorganic, evolve and grow through the conversion of environmental potential energy into a dissipated form known commonly as waste heat. Most of the energy we need to run industrial civilization still comes from fossil fuels with coal being the primary source, and projections are that this will remain so far into the future. 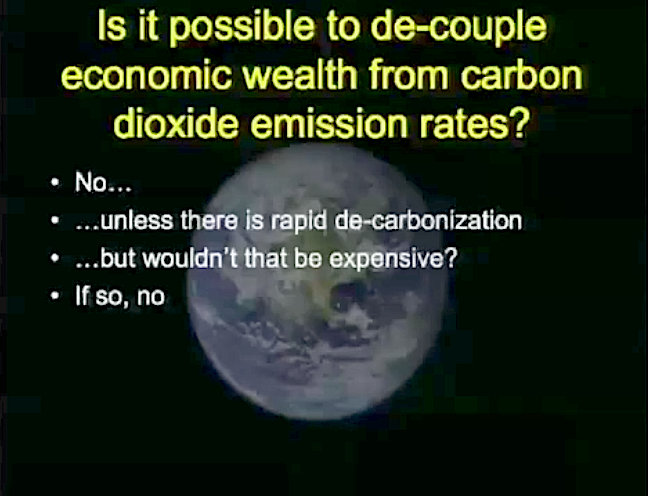 Since fossil fuels give off nasty greenhouse gasses that heat up the planet and destabilize the biosphere, the obvious question is whether our economic engine can be decoupled from CO2 emissions. 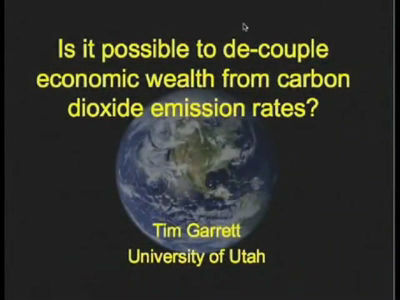 Atmospheric scientist Tim Garrett has a few papers on this subject and a new paper on collapse which I’ll mention at the end, but first let’s review and get an understanding of what he said in his censored paper, ‘Are there basic physical constraints on future anthropogenic emissions of carbon dioxide?‘, as well as the following recorded speech. I consider Garret to be a biophysical economist firmly rooted in geophysics and reality, much like Albert Bartlett and Charles Hall. Improving energy efficiency accelerates CO2 emissions growth. The present state and growth of civilization are determined by the past, and the past fundamentally cannot be changed. Thus we are set on a trajectory that can lead to simplified predictions of the future. Where does the value of money come from? An economist would say that its value is fundamentally belief-based. I believe it has value and you believe it has value; therefore, it has value. From a physics perspective, this explanation is a bit unsatisfactory because it doesn’t really explain where that belief comes from. Why is that belief so resilient? Presumably that belief has some physical representation because civilization certainly is part of the physical universe. It’s not separate from it. We are all pat of the physical world. 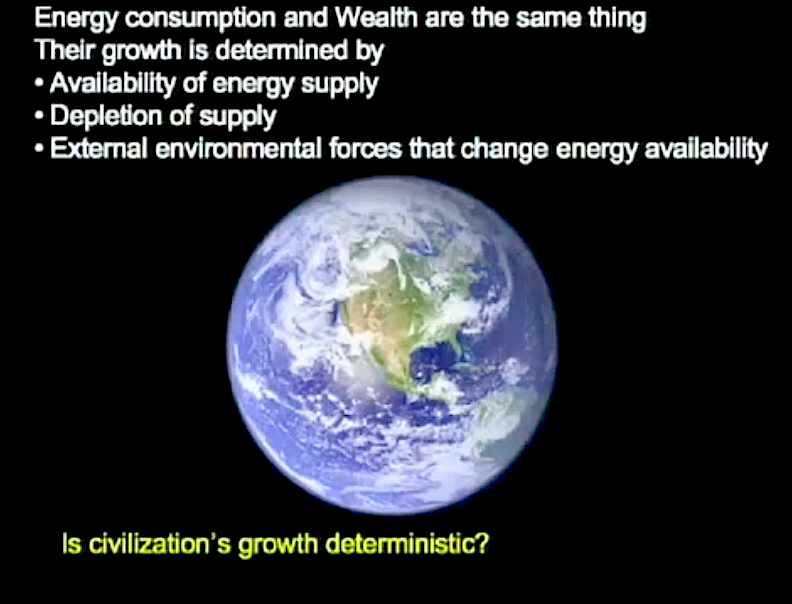 Civilization is an organism that can be defined by how it consumes/transforms energy. Physics can be used to describe civilization. There are basic laws of thermodynamics and, fundamentally, physics is about the transformation of energy from one state to another or really the flow of energy downhill, or more strictly, the flow of material downhill from a high potential state to a low potential state. You can think of a ball rolling from a high gravitational potential to a low gravitational potential. Money is a representation of some energetic flow [economic activity] from high potential to low potential. Economic wealth represents the rate of consumption of energy in civilization. An example of this in nature would be a beaver dam which represents civilization. 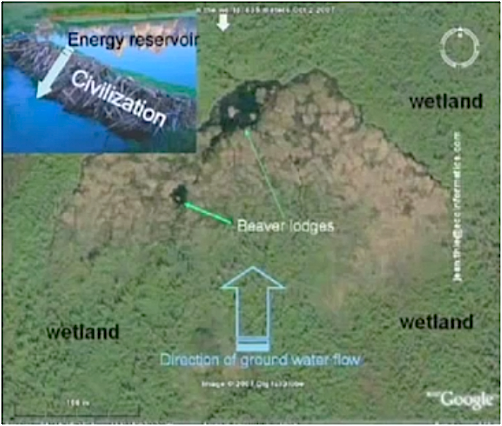 The energy reservoir for the beaver dam (civilization) is the water behind the dam. The flow of water across the dam from a high gravitational potential to a low gravitational potential represents the size of the beaver’s ‘civilization’. Something similar applies to human civilization which represents a gradient between available energy supplies (coal, oil, uranium) and a point of low potential (outer space). 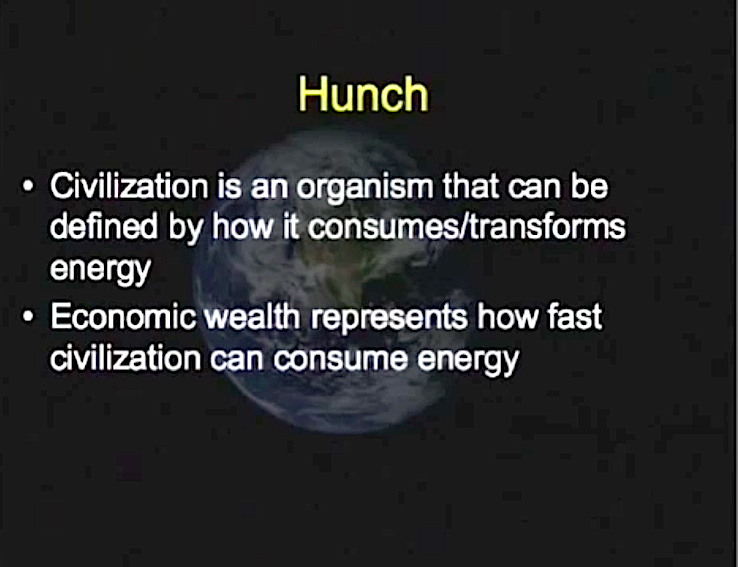 We consume energy, things happen in civilization due to the flow across that potential gradient (high to low) releasing waste heat which radiates to outer space at a cold temperature of about 255 Kelvin (-18ºC). We can treat civilization as a single organism that interacts on a global scale with available energy reservoirs and through the transformation of that energy (stuff is done, economic activity occurs). 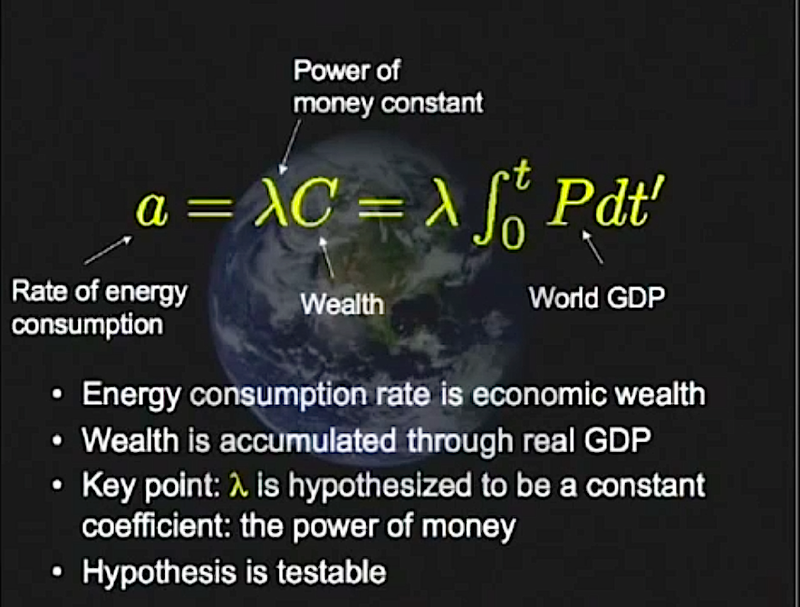 Money is a representation of that capacity to do stuff physically (or how fast it can consume that energy). This is a testable hypothesis and it can be expressed mathematically which means we can look at this quantitatively. Wealth is the value of something that has accumulated over time. Based on what we currently have, we are able to produce more which gives us more power to produce even more in the future. It’s through this spontaneous feedback process that civilization (or a beaver dam) is able to grow. Economists use GDP as a wealth indicator. All the economic production added up from the beginning of history up to the present is the total accumulated wealth for civilization. GDP has units of currency per time, so it’s a production per year. Inflation-adjusted production is producing something new to be added to what we currently have and that added over time creates our wealth. The hypothesis says that this process is related to our rate of energy consumption through a constant value λ (9.7, plus or minus 0.3, milliwatts per inflation-adjusted 1990 dollar]. This can be tested with various historical GDP statistics along with records of world total energy production and CO2 emissions. This hypothesis is supported by the data to an extremely high degree of confidence. 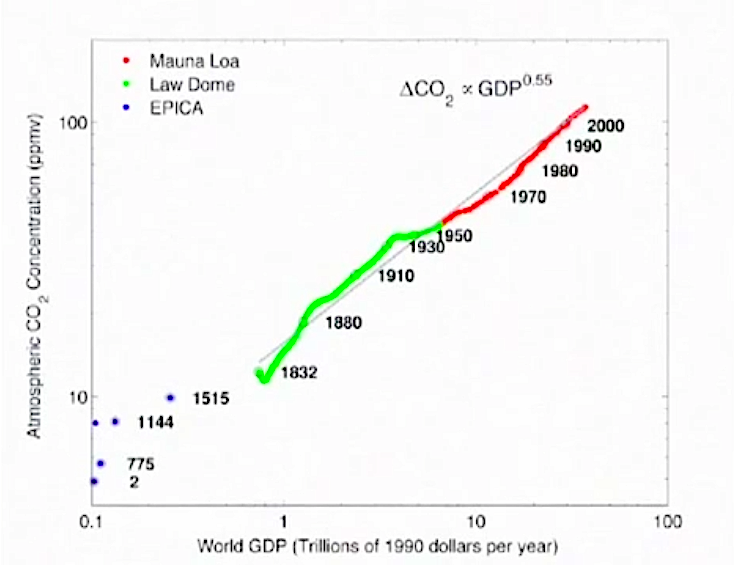 The graph below shows statistics from the year 1700 onward for inflation-adjusted world GDP(P) Green line. The time integral of GDP, or wealth of civilization(C), is represented by the blue line which has increased by a factor of 6 or 7($300 trillion to $1700 trillion) since 1700. Bursts of growth are seen around 1880 and 1950 in the purple line(η) which is the annual percentage growth rate of world GDP, calculated by dividing the GDP(P) by the wealth of civilization(C). 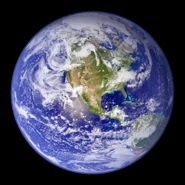 Today the world GDP is about 100 times larger than it was in 1970. 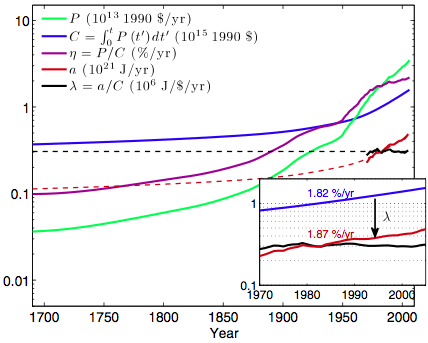 The growth of red line(a), primary energy consumption rate, is essentially moving in tandem with the wealth of civilization (blue line). This suggests that, fundamentally, money is power. The black line represents the constant coefficient of the power of money λ (9.7, plus or minus 0.3, milliwatts per inflation-adjusted 1990 dollar). 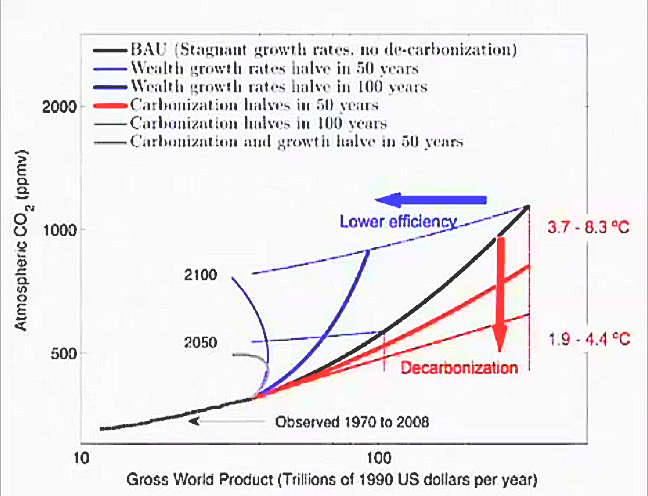 How is emissions related to wealth? 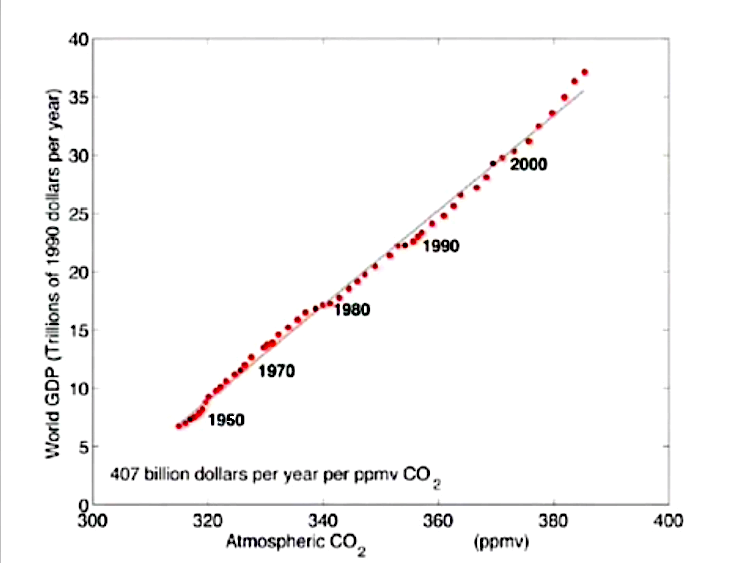 You cannot reduce emission rates without reducing the “wealth” of civilization. 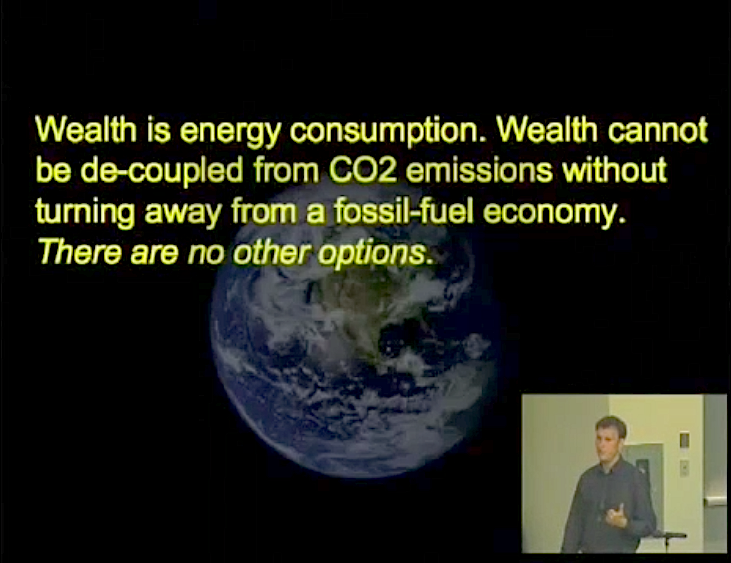 Wealth is energy consumption; energy consumption is carbon dioxide emissions. The two are inseparable. 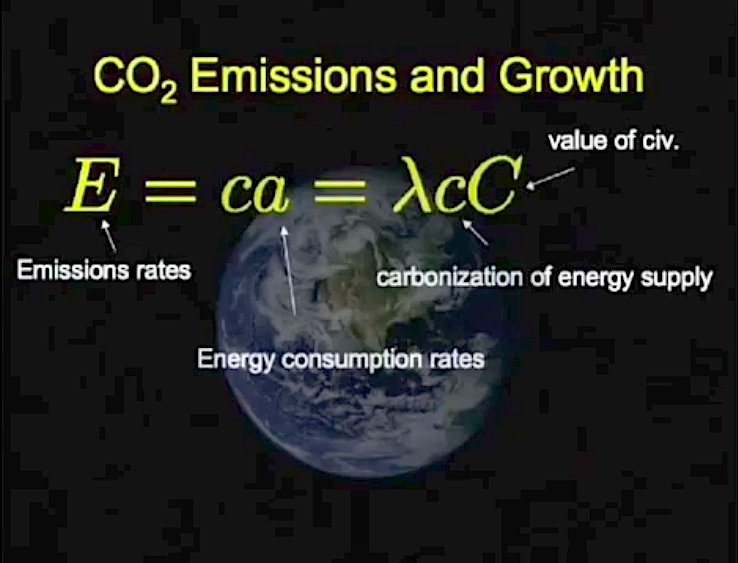 In order to just stabilize CO2 levels, you would have to decarbonize as fast as the current growth rate in energy consumption which would work out to about one nuclear power plant per day (or some other comparable non CO2-emitting energy supply). 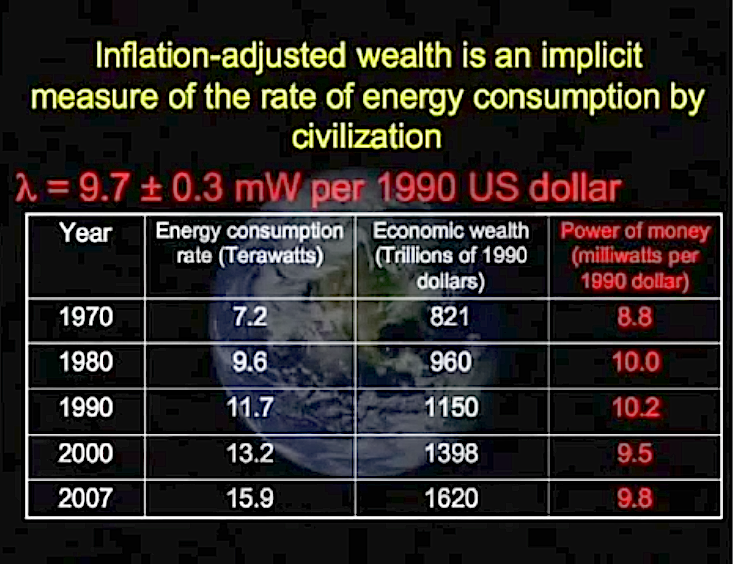 Wealth is a representation of energy consumption rates. 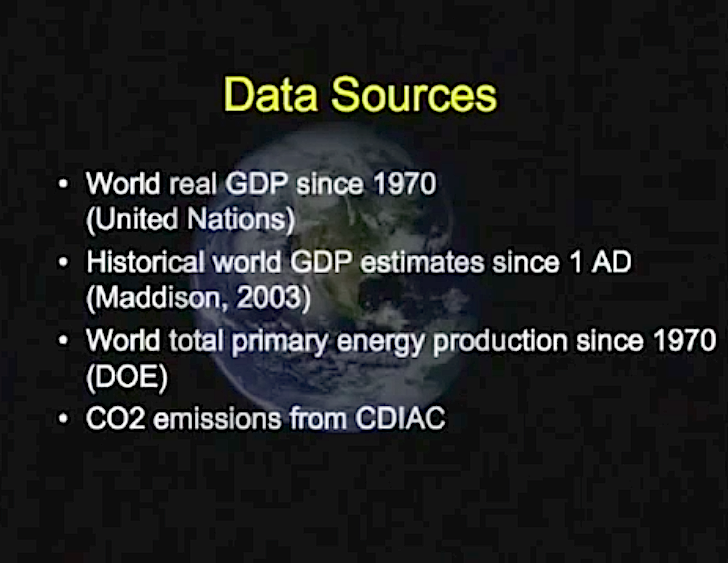 Real GDP is a representation of the growth rate in energy consumption rates. This cycle is fundamentally linked to physics through the parameter lambda λ (9.7 milliwatts per inflation-adjusted dollar). GDP is really just an abstract representation of an ability to increase our capacity to consume more energy in the future. That’s what the production really represents. Civilization is always trying to expand its energy consumption to accumulate more wealth, or reduce the cost of maintenance by improving energy efficiency. More available energy translates into more accumulated wealth which in turn requires more energy for maintenance, creating a vicious circle of unending growth. Energy conservation essentially does not help. The fear of contraction permeates every corner of the economy. In nature a tree takes available energy in sunlight through photosynthesis to incorporate nutrients from the soil and air in order to grow, and as it grows, it is able to do more of that process in the future. For a healthy tree, increased efficiency speeds up this process. If the tree is diseased, then the efficiency would be compromised until it dies, creating exponential decay. We could apply this to civilization. If we increase efficiency, it leads to accelerated growth and more energy consumption. This phenomenon is known as Jevon’s paradox, first noted in 1865. 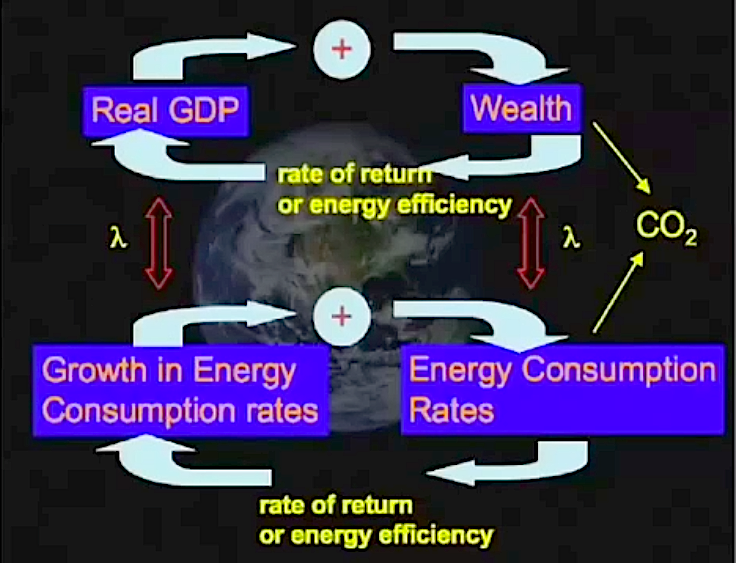 Increased energy efficiency increases the positive feedback of building wealth in civilization which can lead to super exponential growth, and that leads to an ever accelerated increase of CO2 emissions. This feedback loop (rate of return) for building wealth in civilization has increased from about 0.1% per year in 1700 to 2.2% per year, the highest it’s ever been in history. As mentioned before, there are a couple of inflection points in history for this rate of return, one in 1880 and another in 1950 which likely correspond to new energy reservoirs coming online. This means the problem is fundamentally a geologic problem. 1950-1970 was a boom time for the wealth rate of return. This rate of return has been stagnant in recent years for the first time since the 1930’s, probably related to the current economic crisis. The sheer size of modern civilization has vastly overshot the Earth’s regenerative abilities. Biophysical limits on resource extraction are likely a major contributor to this stagnant rate of return. The extraction of low-grade, dirty fossil fuels is a sign of civilization’s energy desperation. We aren’t really decarbonizing. Perhaps we’re trying to, but not really. The model shows that reducing carbon requires a rapid reduction in the size of maintained wealth, as well as rapid abandonment of carbon-burning energy sources at the global rate of 300 GW of new non carbon-emitting power capacity—approximately one new nuclear power plant per day. With business-as-usual, by 2100 the world GDP would be 10 times higher than today and the atmospheric CO2 would be around 1200 ppm. We aren’t really decarbonizing. Perhaps we’re trying to, but not really. - No really, Australia is trying increase coal exports. Approving new large coal mines for India and China to extract - Shenhua, Carmichael. NSW State governments letting Rio Tinto coal bulldoze villages, send species extinct, ruin Agricultural areas and water sources. Clean energy? - The Australian government keeps trying to halt it. New inquiries into health effects of wind farms. No inquiries (seriously prevented) into health effects of coal mines and coal burning. What more do we need to know? Looks like only economic oil collapse, plague, or nuclear holocaust. Maybe a well place nuclear device in the straits of Hormuz - about 20% of global petroleum. Abandon wealth to survive through the ecological catastrophe? - "Bottleneck" - The Straits of Survival. "Changes in population and standard of living are only a function of the current energy efficiency. The model shows that reducing carbon requires a rapid reduction in the size of maintained wealth, as well as rapid abandonment of carbon-burning energy sources at the global rate of 300 GW of new non carbon-emitting power capacity—approximately one new nuclear power plant per day. -- Nuclear cannot be managed, too dangerous, too expensive, too slow to build, uses too much water, not enough Uranium left. -- Wind, solar, tidal, wave, whatever, go for it.